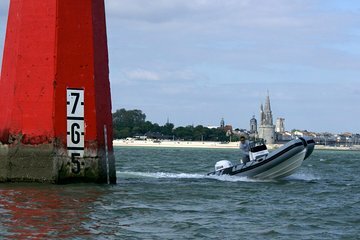 Explore La Rochelle’s coastal waters at your leisure with this 1-day rigid, inflatable boat rental for up to 10 people. Hop aboard your boat in the Port des Minimes and head out onto the waves at your own pace. Perhaps explore local sites of interest such as the Ile de Ré, Fort Boyard and Aix Island, or cast your line and fish in La Rochelle’s clear waters. During your rental, take in uninterrupted views over the beautiful coastline and enjoy a relaxing day on the seas with family and friends.